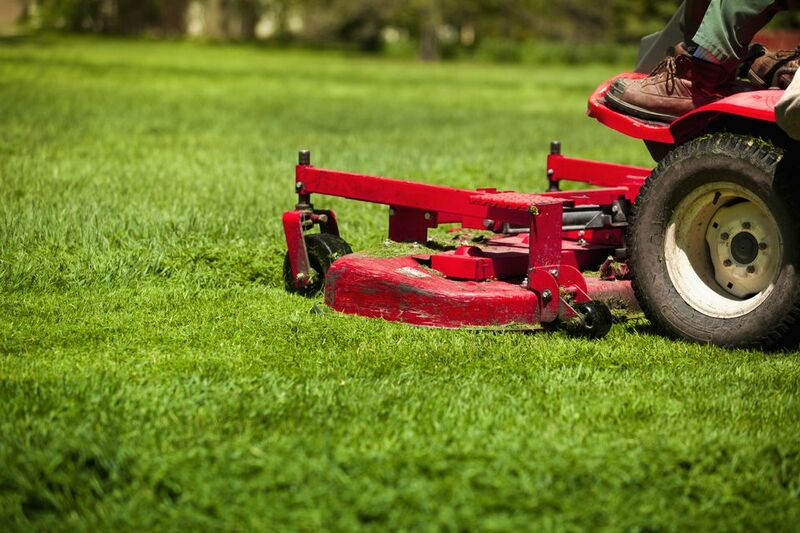 A quick drive through almost any neighborhood where the lawns are planted with cool-season turfgrasses quickly reveals the biggest lawn care mistake known to man—mowing the grass too short! When you understand the effects of this kind of mowing, you'll never look at lawns the same way again. One reason that people cut their lawns so short is a misguided effort to reduce chores. By giving the lawn a crew-cut each time you mow, you might think you can mow every 10 days (for example) rather than every week. In reality, though, you'll really only buy a few extra days between mowings with this strategy; in the long run, your lawn will pay a heavy price for your extra hour of free time, as you'll see. Another reason for the turfgrass crewcuts is an owner's desire to make the lawn look like a manicured baseball field or golf green. Who doesn't want a beautiful green lawn that is striped just like Fenway Park? Or a soft velvety lawn that looks like the 18th green at Augusta National golf course? In reality, these highly artificial "lawns" are achieved with specialized reel mowers and protected from stress with a dizzying array of chemical fungicides, herbicides, fertilizers, and other products rarely seen by homeowners. And they are kept green with a computerized irrigation system overseen by a caretaker and staff of turf professionals with college degrees. Cutting your lawn grass short really won't save you much on lawn chore time, and it's not realistic to think that you're going to achieve the picture-perfect lawn you dream of. In fact, you may well end up with an uglier, more labor-intensive lawn than if you cut the lawn to a proper length from the start. A lawn of dense turf grass shorn to a uniform one to two inches is a beautiful thing to behold—for a little while, anyway. The problem is that this kind of mowing puts an enormous amount of stress on the turf. Each blade of grass is a leaf, and with less leaf area, each grass plant has less surface area to provide the photosynthesis that fuels leaf and root development. When the lawn is mowed very low, the actual crowns of the grass plants themselves can be injured by the lawnmower blade, and this opens up a host of cascading problems. As the plant puts all its energy into recovering from the crown damage, it opens up a weakness in the lawn, increasing the pressure from weeds, insects, and diseases. Once a lawn suffers widespread crown damage, it may struggle against weed invasions and grub infestations for the entire growing season. Even if the plant crowns aren't physically damaged, the short grass offers little shade to the sensitive plant crowns, making the lawn susceptible to summer heat stress. These conditions favor the never-ending cycle of using chemical herbicides and pesticides to deal with problems that occur season after season. The multi-billion-dollar lawn care industry is only too happy to play along with the notion that insecticides and herbicides must be applied religiously every season. The solution is very easy. Mow the lawn as high as possible—as high as you can comfortably tolerate. Most homeowners find that three to three-and-a-half inches is a good height, though it may take some time to become acclimated to a length that feels a little shaggy at first. Mowing the lawn to this height once a week (or less during heat and drought stress) will ease the stress to the plants and result in an overall healthier lawn. Using a mulching lawn mower is even better; returning the clippings to the lawn saves work and provides another source of organic matter to the lawn. A longer lawn means more leaf blade, and this provides several benefits. More leaf blade means more photosynthesis, which results in stronger, more prolific root and shoots growth. This, in turn, means the plant is better able to withstand stresses such as drought, insect infestation, and heat. Healthier individual turf plants lead to a denser lawn that will crowd out weeds. Longer grass also has the effect of hiding whatever patchy, thin areas do exist in the lawn. All too many homeowners react to the presence of weeds assuming it's necessary to "get out the chemicals." This is a myth that lawn care services and chemical manufacturers are all too ready to perpetuate. In reality, though, the reason for the weeds is very often a lawn that has been stressed by mowing it too short. The solution may be ingeniously simple: let the grass grow to a longer height and keep it there. Once you have recognized that a longer lawn is healthier than a crew-cut lawn, be careful not to go to extremes by letting the grass grow to six or eight inches or more between mowings. Most lawn care experts recommend cutting no more than one-third of the total length of the grass blades each you mow; trimming a smaller amount is even better. Very long grass is hard to mow effectively—the grass blades tend to tear rather than be sliced off cleanly by the lawnmower blade. Too many clippings can form a matt on your lawn that blocks sunlight from reaching the grass blades and mars the appearance of your lawn. And as anyone who has done it knows, mowing very long grass with a push mower takes a lot of effort. If you have settled on a three-inch mowing height, for example, don't let the grass get longer than four or four-and-a-half inches between mowings. Trimming frequently with a mulching mower to keep your lawn turf in the three-to-four-inch length range is a great prescription for a beautiful, healthy lawn.